Flat Tire? What To Do. Just been in an accident in the Norcross, GA area and your vehicle is left disabled? Chris Roadside Service & Tow is here to help. We quickly dispatch a tow truck service from our team out to your location. Once at your location, will take over the situation. Our towing services are here to take care of the necessities and get your vehicle off to a location of your choice. Chris Roadside Service & Tow is not only a roadside assistance and towing service we also offer many services to help you with any vehicle dilemma. We are a one stop shop for all your car roadside services in the Norcross zip code area. Our auto towing services includes light towing along with a full roadside assistance program to serve the Norcross, GA area. We always provide trained drivers for all of our tow and roadside assistance calls along with the best equipment suited for the job. Our roadside assistance service is the best in the local towing service area. Our wonderful customer service along with our responsive, kindly, and reliable services will have you calling us each and every time. When you’re in an accident and they ask you who to call the answer will always be: Chris Roadside Service & Tow. No picking up your smart phone and asking “where is the nearest towing service” or “where a towing truck service near me?” Always know the answer will be the towing providers at Chris Roadside Service & Tow. Why Call Chris Roadside Service & Tow? When you find yourself in a dilemma with your vehicle never hesitate to call us. We offer a speedy assistance to resolve all those roadside issues. Our Roadside assistance services are here to help motorists in the most stress situations. Finally a reliable Towing Company in Georgia! We are highly reviewed by our customers! When you have a flat tire our Flat Tire Assistance is dispatched out to your location to promptly change your flat. No matter the situation or weather outside our team is here to help. Along with changing your tire we also offer a Fuel Recovery program to bring you gas day or night. It can be stressful worrying about getting to the next gas station. Don’t let it get you down, just call us at 770-766-5758 . Our Battery Service and Jumpstart Assistance is there for the morning or night when your battery has let you down. No Start Service expert quickly comes out to your location and assists with getting your vehicle running again. We provide prompt Lockout Services for the Norcross, GA area. That means the next time you lock your keys in the car, just give us a call. We will save you time and aggravation. ​ We are also there for those times that your vehicle has an issue. Our Engine Malfunction service team comes to you and helps determine what the issue is and assists with the next steps. This service can also tow your vehicle to a location of your choice for more assistance. Check our reviews on Google and Bing! You won't regret working with our tow company! Along with our great roadside assistance services we also offer Emergency Towing for those accidents and times when your vehicle just needs a lift. We offer Wheel Lift Towing and Flatbed Tow Trucks to accommodate a variety of vehicles. Having both services available ensures that we are doing the best services we can for all our customers. Along with towing we also provide Car Transportation. This is a scheduled service to get your vehicle or equipment from one location to the next. Whether you are moving and need someone to take your car to the location or need equipment at the next job site we can help. Call our office today (770) 766-5758 for details. ​ We also offer a variety of specialized services that include: Winching and Vehicle Recovery. Additionally we offer Luxury Vehicle and Limo Towing for those customers with vehicles that need special care. Our experts are trained to handle specialized vehicles with care and excellence. Not an emergency? Request a quote! Our customers often ask some of the questions below. If you have any additional questions please do not hesitate to give us a call today. We are open 7 days a week. ​Our tow truck drivers are trained to handle a variety of vehicles. We tow anything from a car to a small truck. We are also able to tow a variety of equipment and most things with wheels. Give our office a call today at 770-766-5758 and we will see what we can tow for you. ​WHO IS THE CLOSEST TOWING SERVICE NEAR ME? Chris Roadside Service & Tow is always the answer is the Norcross, GA area. ​DO YOU OFFER BOTH LIGHT AND HEAVY DUTY TOWING? ​WHAT KINDS OF TOW TRUCK DO YOU HAVE? ​Our fleet of tow trucks is a wide variety of trucks. We have flatbed trucks along with wreckers. We are able to meet towing capacities for 99% of our customers. ARE YOUR TRUCKS IN GOOD CONDITION? 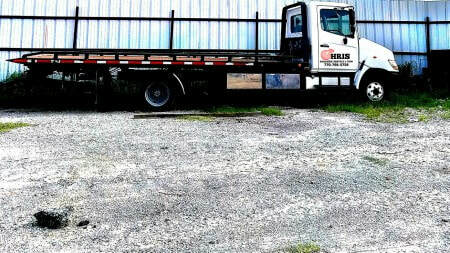 ​Each of our trucks are in great condition. Towing companies only have one store front. That is the trucks they drive. We make sure that they are in tip top shape. ​WHAT TYPE OF TRAINING HAS YOUR DRIVERS COMPLETED? Our staff has completed all DoT training and testing along with a test that our company requires all staff to complete before completing any service calls. ​We typically are able to get to a location in the Norcross, GA area within 30 minutes. When you place a call with you we are able to give you a time frame. Affordable tow truck service in Norcross it's not a dream! Call us to prov it to you! Can you provide me with an estimate? When placing a call with our company we are able to provide an estimate of the costs. DO YOU TAKE CASH AND CREDIT CARD PAYMENTS? We take both forms of payment. ​We provide customers with roadside assistance services that includes a variety of services including fuel recovery, jump start services, and much more. WHERE ARE YOU TOWING MY CAR? We only tow our customer’s vehicles to a location that they have arranged for us to tow it to. DOES YOUR TOWING COMPANY WORK WITH MY INSURANCE?